Product information "Haibike SDURO Hardseven Life 3.0 gray/gray/coral 2019"
The SDURO Hardseven Life is equipped with 27.5 inch wheels. These guarantee very agile and agile handling in easy terrain and on trails. The 120mm suspension fork and the 180mm disc brake provide the necessary security. The Life models are specially tailored to the needs of women. In other words, the Life models have custom geometry, a special saddle and special grips. In addition, the frames are also made in small sizes. Thanks to the 20-speed gearshift you always have the right gear for every terrain. So you're not too steep! This is also ensured by the powerful Yamaha PW-SE engine with 250W. The 500Wh battery ensures that you can handle long trips without any problems. Thus, the SDURO Hardseven is the perfect choice for longer tours in easy terrain and on light trails. Fork SR Suntour XCR Air LO-R Lockout, air, travel: 120mm, steel shaft 1 1/8 "
Tire Schwalbe Smart Sam, 57-584, 27.5 "x 2.25"
The concept of a so-called "victim component" is pursued: similar to a helmet, it degrades by deformation or destruction those impact forces that would otherwise damage the much more expensive engine. For this reason, we also use a special, impact-resistant plastic. This can on the one hand good forces derive and remains on the other hand, even with great deformation dimensionally stable. Because unlike metal, which would bend permanently, plastic returns to its original state. The production in the paint color perfectly conceals scratches and damage. If necessary, the SkidPlate can be exchanged easily and inexpensively. 1.7 "LCD display for a wide range of applications with easy-to-use and large display of speed and battery capacity. The power supply of the side switch is ensured by the battery of the drive unit on the wheel. In addition, the high-quality appearance of the display. 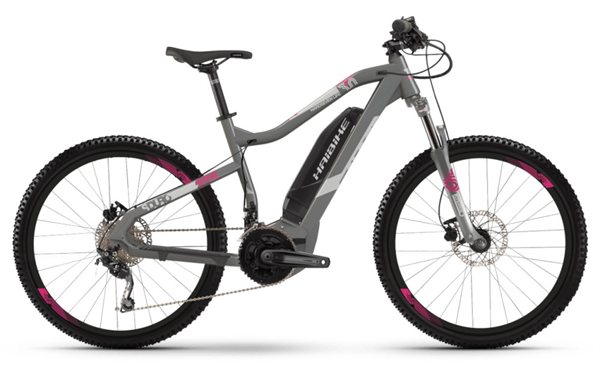 Related links to "Haibike SDURO Hardseven Life 3.0 gray/gray/coral 2019"
Customer evaluation for "Haibike SDURO Hardseven Life 3.0 gray/gray/coral 2019"